My sister and nephew was in town visiting last week so I really didn’t have much time to keep notes but was able to snap a few shots from earlier before they arrived. Busy, busy the girls have been. Lots of new movies (and getting caught up with Downton Abbey which Miss Sky has been getting in with too and loves that it started right after the sinking of the Titanic.) 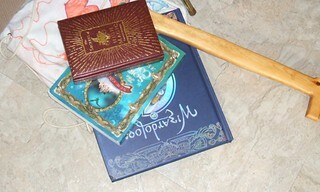 , readings of library books, and new games but those will have to wait until next post. Since I left off my last “Week In The Life” post with Miss Sky enjoying her new DS game electroplankton I think I will start with Miss Sky finding a keyboard game from Girl Games.com. She also found a manga game too. Little Sis decided to write a book. and there was that book reading thing I mentioned. Miss Sky doesn’t just sit and watch movies for hours, she has a reason for watching them. It is nice when we are not so dismissive of our children’s interests. Who knows who might grow up to be a script writer, camera operator, set designer, costume designer, or animator? Who knows what carer one might find having a keen eye for detail? I want to start out this post by saying I almost messed up reading in our household. I have written previously of my journey into reading and the letting go of my “book worship” by realizing how much “reading” both girls do on a daily basis. I found out along the way that the very books other homeschooling circles dismissed as “twaddle” were what the girls actually enjoyed reading and why would I not want my daughters to enjoy reading? Once I got past this hurdle reading took off in our home *beyond* any of my expectations. I also realized the point of learning to read is to be able to gather information. If my children were in school they would be taught all the fundamentals of reading and writing. They would need to know how to read and write to be able to read the textbooks (which many schools now use tablets) and answer questions or write reports so the teacher can make sure the child understands what they are reading. They need to be able to read and write to pass tests. Since we unschool we do not use textbooks as our only resource to gather information. There are more ways to gather information than just books. Since we unschool I am with my children all day and since we do have conversations and they ask me questions when they have them I know what they are learning. There is no need for them to take tests. Both girls are able to use the computer and research any questions they may have. Both girls are quite capable of finding video games, games, books, movies, YouTube videos, recipes, crafts or just about anything they might want to use to further their knowledge. As their facilitator I help fill in the cracks with anything they might have missed or didn’t even know they would like. I set up our “nest” with lots of interesting things that I might find that could spark curiosity. Maybe it’s a new puzzle. Maybe it’s a new poem I might write on the chalkboard that is in our kitchen. Another example is we have a table that I set different things on in our living room like maybe one week there might be new magazines or different pods or seeds we found while hiking. Right now there is a holder filled with pens and pencils and a Christmas word search and game tablet that my dad sent us. 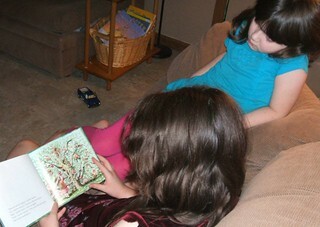 The girls are surrounded by information. One more example I will use is Miss Sky found a book about the Titanic *she* loves. I noticed not very long ago on Netflix there was a BBC miniseries about the Titanic and asked if she wanted to watch it with me and she did. Papa and I love music, I mean all sorts of music from Jimmie Rogers to Foo Fighters. So I didn’t hesitate adding a CD filled with songs that was played during the Titanic’s voyage to our collection. Which led Papa down the rabbit trail of discovering Scott Joplin which led the girls to making their own black and white silent movies. 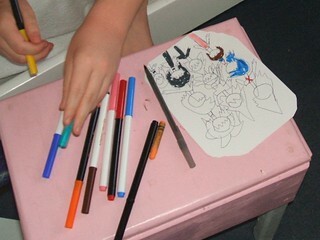 This is what unschooling looks like in our home. So now with all that being said what were the girls favorite resources we used in 2012 to help learn the art of language? , flip books and lots of comic books. The more research the girls do on-line, especially Miss Sky reading video game and game console reviews (she researched both the Wii and 3 DS to make sure they were what she wanted) the better their spelling and typing get. Little Sis realized she could read this year. I give her playing video games on the computer, like Animal Jam, most all the credit. Miss Sky’s spelling increased tremendously by her wanting to make sure her words were spelled correctly while talking to the other “jammers”. and to creating all kinds of works of art. The X-men cartoons on Netflix introduced the girls to the world of science fiction and comic books. 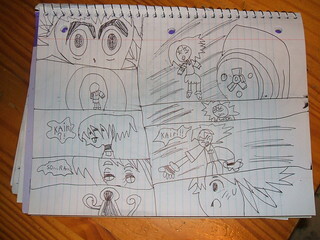 The video game Kingdom Hearts introduced the girls to the world of Manga where Little Sis pieced together she could read more than her favorite book series Elephant and Piggie. and Miss Sky researching character and plot developments from her favorite video games for her own characters development. Since sketch books can get a little pricey, for us anyhow, the girls learned how to create rough drafts by first using notebooks to sketch out their story. Miss Sky has also been watching the behind the scenes of how animated movies are made and has been using her walls like a draft story board. The girls like to mute movies and come up with their own story-lines too which can get rather silly at times. Magazines? Miss Sky loved her subscriptions to Ranger Rick and Nintendo Power last year however Nintendo Power has stopped publishing and she has moved on from Ranger Rick with the magazine Otaku USA. but she too feels it is time to move on with Ranger Rick and Lego magazine. She also liked her subscription to the Highlights Puzzle Club. The stories Alice in Wonderland and Fruits Basket( with the girls getting me hooked on my first manga series) played a really big part in our year too. Last but not least we love playing the games Disney Apples to Apples (with poison apples using opposites), Disney Pictionary, Charades,and hangman (which is a fun use of the chalkboard too). Yes I think we had a very productive year and want to end these posts by saying all of it came by me following the girls interests. No curriculum, no forced worksheets, no forced anything. Every single thing I listed from this year’s review posts was what *they* wanted to do. I don’t know if it is my age, me maturing or what but this year I am really being drawn to my roots. I am feeling my role as homemaker. Maybe it is my new awakening or a combination of all the above, it is hard for me to put into words but it all boils down that I love the role I play in our family! For awhile I think I have been carrying a chip on my shoulder, not even realizing it that I had something to prove. Like because I didn’t go on to become some successful business person or something. I think these feelings were tied to my past. There really isn’t a easy way to put this but I moved, really ran away from home at the age of 18. I moved to Indiana from Kansas City Missouri telling no one but my mom and sister at the time and they got lucky just to be there. My childhood was not a very nice one. Last year I tackled, as Miss Sky likes to call it “the big boss”. It was a HUGE moment in my life. Running from the support system that I did have may have altered my future a little bit but I always knew what I wanted to be when I grew up. I wanted to be just like my grandmother. She was first born generation in America, her parents migrating from Belgium. She lost her mother when she was very young, my great-grandmother died giving birth and my great- grandfather couldn’t handle the responsibility of being a single father in a new country so my grandmother and her siblings were raised in an orphanage. After she met my grandfather she became the ideal picture of “homemaker”. She would wake early to make sure my grandfather was fed and made his lunch for work. She started dinner at the same time every evening to be ready for when my grandfather came home, never once complaining. Fridays was wash day and she had one of those old crank washer machines, that I loved helping her with, and then we would hang the laundry out to dry. She would tidy up the house and watch her soaps in the afternoon. She also loved to sew. What I saw was a woman who loved what she did. I was very spoiled by my grandmother as she took care of me from when I was an infant until about 8th grade while my parents worked. Doesn’t sound too bad right? These are some of my happiest memories. Well life happens and people can be selfish and things change and some bad choices kept me wandering around for awhile but it was my grandmother who heavily influenced my life. Well times change and women didn’t “have to” stay home anymore so why would they instead of following their own dreams? Please do not take me wrong I am SO thankful to be able to live in a time where we have the choice and believe we should all follow our dreams as long as we do not sacrifice responsibilities for them. In taking the long way around that was my point. Being a homemaker has always been *my* dream. I also wanted to homeschool, I saw first hand with our oldest the toll public education can take on a person (and yes I know this isn’t always the case for every child but it was for ours). I saw a very bright child quickly lose their interest for learning. Like my childhood journey I made some choices that kept me wandering a bit here too. Learning? Yes lots of new things but lets start with games like Wizard Junior, Frog Juice, Monopoly Deal, Animal Rummy, and Spot It. Oh we are having a hard time passing Bowser’s castle in Super Mario Brothers, we get SO close then die. I know we can do it though. We also played Wii Party. Lots of Minecraft for both girls as they made a world where everything is big to look like they shrunk, like Alice and Little Sis played her new Putt-Putt game, Putt Putt Travels Through Time, on the computer. For the 3DS both girls picked out their first 3DS game, besides Mario Cart that came already installed, Nintendo Dogs. Yes they each already have a version of this game for their DS and yes they could play it on the 3DS but each game comes with different breeds you see and this one comes with cats too. Miss Sky picked out toy breeds (her favorite category from the dog shows) and Little Sis bulldogs. They played these pretty much daily then Miss Sky received her new game in the mail, thanks to a recommendation from an unschooling list, called Electroplanton. She loves this game! 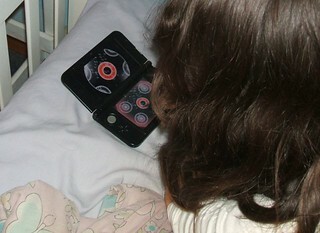 She has been using her 3DS to record and make different sounds and with this game she can make her own music. 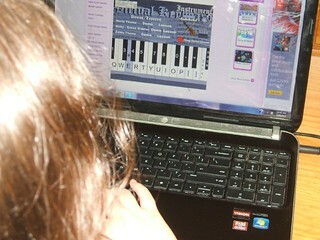 We bought ours through E-bay and she quickly figured it out and has been coming up with her own tunes. Have I mentioned we are *huge* Danny Elfman fans and have several of his soundtracks. Now I am on the look out for a used keyboard(garage sales). 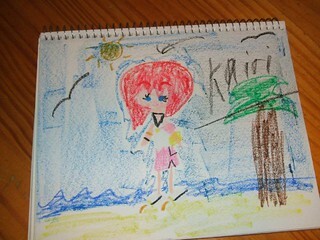 Still lots of drawing as the girls experiment more with color pastels and getting good using them too. Our family movie this week was the new Ice Age movie, Continental Drift. Wishing peace for your journey. Over the weekend the weather was unseasonably warm , for a day, with temps in the 60s. Little Sis wanted a new Putt-Putt game and found the one on E-bay she wanted me to order, it arrived on Saturday. Last year Disney played a *huge* part in the girls learning. I myself let go of my “commercialism” pride and know what the girls learned to be better consumers by me giving them the choice instead of being all-controlling about it. Looking back over the year I definitely give the Disney video game Kingdom Hearts credit for the new-found love of all things Disney. 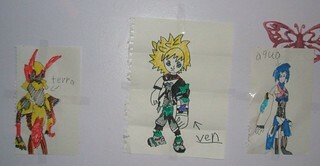 In fact I give the video game Kingdom Hearts credit for most of the girls learning last year period. Then again I think it was the original X-men cartoon that led Miss Sky on the learning journey of mythical creatures with her love of the phoenix then the discovery of Ology World then the book Mosterology then Egyptology, Dragonolgy, Wizardology, and finally Mythology. So this led to watching Disney’s Mulan and learning about Ancient China, honor, gender discrimination, the Great Wall of China, and the Huns. Then there was Arthurian myths and legends and watchings of The Sword in the Stone, learning about King Arthur, the wizard Merlin, more mythical creatures, and the history of magic. Which led to Robin Hood, and discussions of the crusades. The Disney movie Hercules launched discussions about Greek Mythology, gods, goddess and its difference and similarities from Norse Mythology. The movie Tarzan led us into the Victorian time period with discussions of Queen Victoria, fashions, houses (there are some beautiful Victorian houses in downtown Greenfield), which led us to watch the Titanic miniseries and talks of class division. 101 Dalmatians led us around London, Beauty and The Beast took us around France, and Aladdin into the Middle East. Pocahontas brought us to the States with the founding of Jamestown, talks of King James, and the age of exploration. We had a 2012 presidential election, debates, voting, and change. and visits to Kids Commons in the city of Columbus and the Chinese Zodiac. customs, religion, architecture, clothes, and vegetation. We also learned about Madagascar Africa and Miss Sky was paid a visit from her twin Pen Pals who were doing a coast to coast road trip from California. Miss Sky learned map skills by tracking her E-bay purchases, watching the weather channel and playing video games like 007 and Globe Trot from Wii Party. Other favorite supplies were the Little Travelers DVDs. and The Kopper Kettle. Both are well worth the drive. I thought I would explain a bit more how we use Pinterest for “strewing” in our home not only because I love Pinterest but it really is a huge help. At first I gave each of the girls their own boards on my account but these quickly spread out into more boards as their interests grew. Miss Sky, myself, and now Little Sis contribute to boards created to hold some of our favorite art work (Miss Sky has really taken interest in Asian artisans), vintage fashions, and a board titled What About Earth where we pin pictures of food, clothes, or anything that interests us from different cultures around the globe. Miss Sky really took interest in different cultures this year. She has also taken a big interest in historical fashions and set designs. While at Goodwill she has been collecting vintage objects like records or things that might be part of the 90s household to use as props while she films. She even wants to try sushi. Well up next is Language Arts. Little Sis has asked that regular library trips be added back to our days so today that is where we headed. 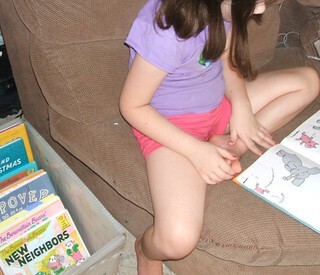 See picked out about 5 Berenstain Bears Books that she had never seen. It amazes me how much the girls notice stuff like this now. and before I knew it we were watching some new movies, playing more games and I have a whole week to post. So let us start with movies. The girls were gifted a few new movies as presents and while watching the previews (that we must watch to see what new movies are coming out don’t you know) Miss Sky found a Miyazaki movie she wanted to see called The Secret World Of Arrietty. It is based on the book The Borrowers and both girls give it two thumbs up. While at the store Little Sis noticed they had a WordWorld DVD and asked if we could get it so we did. We used to watch it on Netflix until they stopped streaming it and she really liked the show. We try to catch it sometimes on PBS but she wanted to have it to watch before bed (we like to watch calming shows before bed to help us wind down). Speaking of PBS Miss Sky and I watched the television show Downton Abbey. Oh my how we enjoyed it. Miss Sky noticed right away the fashions were from the 20s and wanted to know how much time after the sinking of the Titanic this takes place. We also watched Madagascar 3 as a family. Games? Minecraft for both girls. Animal Jam, Girl go games, more Putt-Putt, Memory, Frog Juice, and Monopoly Deal for Little Sis. 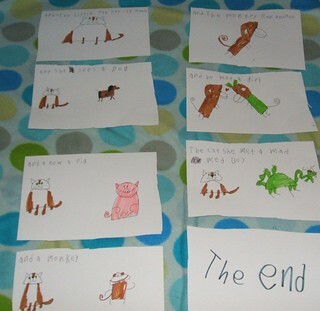 We played Disney Pictionary, and lots of Wii Party as a family. 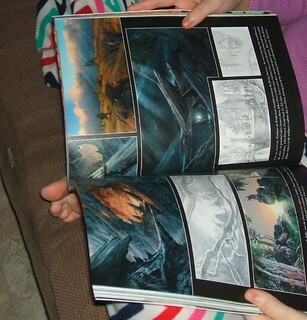 and she found a copy of The Hobbit movie guide while at the store she has been looking at ever since. She also has been learning more and more how to use her 3DS to make movies and now is coming up with her own special effects, cutting and editing scenes, and coming up with all different kinds of sounds to record. 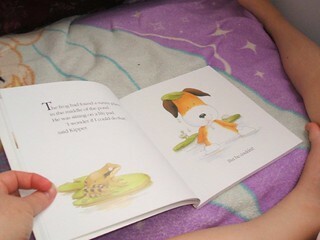 Little Sis and I have been doing some reading as well with her new Kipper story collection. This is another show that she really likes and watch before bed. I understand now why so many people like this show as I enjoy watching it with the girls just as much as they do. What a year we had. So many, many positive changes. Not just learning wise but in ourselves too. At first glance while looking back I thought our year might look a little thin but as I starting listing everything I myself was amazed how full our year was. This year we did not do as many external activities as I would have liked but Miss Sky really wanted to stay home more and Little Sis didn’t mind one bit. It was much harder for me to categorize our year because everything connects to everything. For example art connects with history, math, science, social studies, language arts, and geography. When listening to The Beatles music for instance let’s take the album Sgt. Pepper I can connect all those categories. Music is filled with math, what was happening in history while the album was out? What was the UK like? Oh they have a Queen, how is their government different from ours? Songs are a form of poetry, and what is with all the colors and hair? Which brings me back to art. So instead I like to think of this more as a chapter from a novel. It is just one part of the whole story and though it could stand on its own it will make much more sense once completed. ~Little Sis (what didn’t she learn?) addition, subtraction, place value, telling time, money, critical thinking, strategic thinking, spatial skills, probability, reading a grid, geometry, buying and comparing prices. I mean this child at 7 can find the best priced computer game she wants on E-bay and pin it to Pinterest for me to order. These kids know more about games, books and the supplies they need at the best prices than I do. The games Bingo, Toss Up, Frog Juice, Wizard Junior, Rummikub, and Checkers. Critical thinking, problem solving, strategic thinking, estimation, rounding, savings, decimals, percentages(Goodwill 50% sales), probability, spatial skills, comparison shopping(E-bay), budgeting(allowance and saving to get a 3DS), geometry, running a business and household. At first I thought I wouldn’t have a whole lot to post here but then I came to technology and boom. Lots of talks about evolution, animals, hurricanes, the Ice Age and learning the difference between mastodons and mammoths. She even came up with her own fiber experiment finding polyfill to be the least absorbent than cotton or wool. 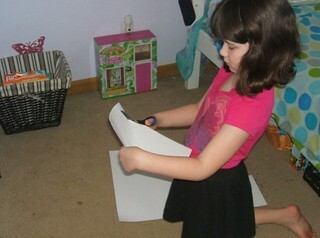 She learned how to create her own video games at Sploder.com, make movies with cut scenes using the Webcam on the computer and with her Nintendo 3DS and used all kinds of sound and special effects. Little Sis learned how to make movies and use special effects with her 3DS too. reading the companion Nintendo Dogs guide, and with us watching our yearly Thanksgiving Day tradition of the Dog Show. We watched the movies Tron 1 and 2 as well as the Transformers and Marvel movies Iron Man 1 and 2, The Hulk, Thor, Captain America, and The Avengers checking out the computer graphics and seeing how much they have changed. We experimented with which substance makes the best fake blood and found food coloring to be our favorite. We hiked at our favorite park during each season. We observed the life cycle of a robin by first seeing the proud parents build their nest, then lay their eggs, hatch, and finally fly the nest. We paid a visit to the Indiana State Museum and the St. Louis Zoo. 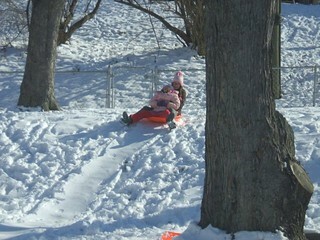 Both girls played with Instant Snow and Little Sis loved her My Big Backyard subscription but has asked to be upgraded to Ranger Rick this year. Up next History, Geography, and Social Studies (Whew). While playing the board game from Wii Party, during my turn I rolled 8. As I advanced my 8 spots I landed on the spot marked -4.